Researchers have discovered that using two kinds of therapy in tandem may be a knockout combo against inherited disorders that cause blindness. While their study focused on man’s best friend, the treatment could help restore vision in people, too. Published in the journal Molecular Therapy, the study builds on earlier work by Michigan State University veterinary ophthalmologist András Komáromy and colleagues. 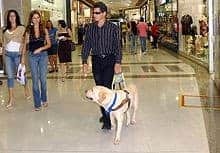 In 2010, they restored day vision in dogs suffering from achromatopsia, an inherited form of total color blindness, by replacing the mutant gene associated with the condition. While that treatment was effective for most younger dogs, it didn’t work for canines older than 1 year. Komáromy began to wonder if the older dogs’ cones – the photoreceptor cells in the retina that process daylight and color – might be too worn out. So, Komáromy and colleagues recruited more dogs with achromatopsia between 1 and 3 years old. To test their theory, they again performed gene therapy but first gave some of the dogs a dose of a protein called CNTF, which the central nervous system produces to keep cells healthy. At a high enough dose, its effect on photoreceptors is a bit like pruning flowers: It partially destroys them, but allows for new growth. “It was a long shot,” said Komáromy, associate professor in MSU’s Department of Small Animal Clinical Sciences. While achromatopsia is quite rare, Komáromy said it’s a good model disease for other disorders affecting the photoreceptors, conditions that constitute a major cause of incurable blindness in dogs and humans. Those disorders affect individuals of both species in much the same way, so the combination treatment’s promise isn’t just for Fido.